Double tropical activity has been observed in the North Indian Ocean’s Arabian sea and Bay of Bengal. On the average there are four to six tropical storms in this basin but this year there had only been one in the Bay if Bengal in October. Indian Meteorological Department (IMD) is the Regional head responsible for monitoring the cyclones. The tropical activity of 2012 in the north Indian Ocean has been the lowest since many years the season has just started with the formation of cyclone ‘Murjan’ in the Arabian sea on October 24 that was being predicted to form in the Bay of Bengal during last week of October. The Joint Typhoon Warning Centre (JTWC) has also declared ‘Murjan’ as a tropical storm. Various numerical forecasting models showed that the Bay’s system would be much more stronger than the Arabian sea however the Arabian sea depression has intensified more than expected while models show that Bay’s system would not reach cyclonic storm status as of October 24. Upper air cyclonic circulation formed over south-east Arabian sea near western coast of India on October 21. As the system moved away from India on October 23, it intensified into a deep depression ARB 01. On October 24, it intensified further at 1000 mbar as the vertical wind shear dropped significantly and became cyclone ‘Murjan’. A fresh tropical wave is also forming in the Arabian sea. 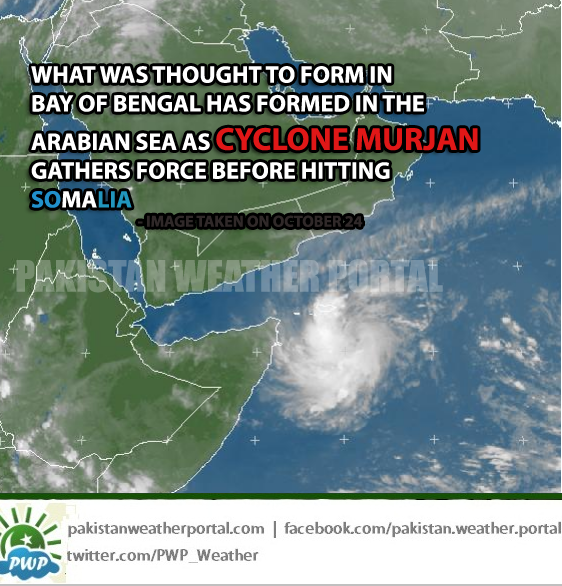 Cyclone Murjan has made landfall over Somalia as forecasted by PWP, for more details see previous update. 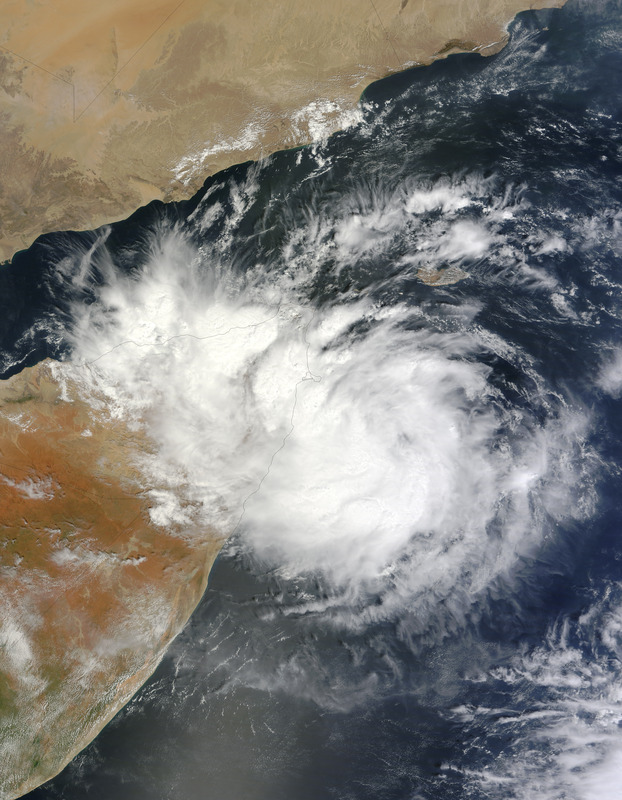 Heavy downpour (more than 60 mm) along with strong winds (45 km/h gusting to 62 km/h) have already started in north-east cities of Somalia as cyclone is nearing for landfall. Landfall is expected on October 25 night/October 26 morning, Murjan would weaken before landfall. An upper air cyclonic circulation formed over the Andaman sea near Myanmar on October 22. On October 24, it was over the same area with slight intensification. 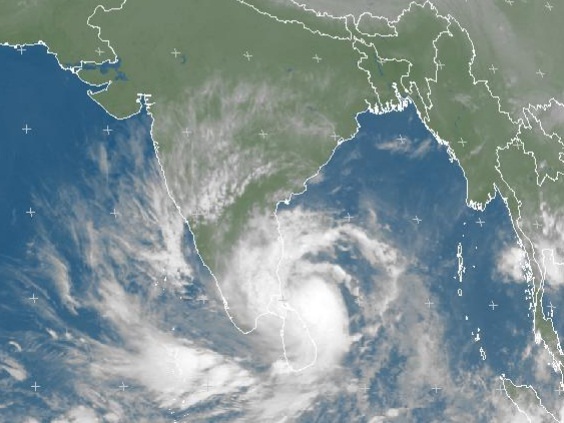 Intensified Cyclone Nilam hitting Tamil Nadu! Western disturbance ’04’ lies over northern Afghanistan and it is likely to move into the northern sub-continent thus causing the remnants of Nilam to move in a NNE direction towards north-eastern parts of India. EAST INDIA BRACING FOR POWERFUL CYCLONE NILAM! Cyclone Nilam is the strongest cyclone of the current 2012 North Indian ocean cyclone season. Landfall is expected on October 31 with severe weather conditions likely. This weather system has the potential to bring scattered destruction to the eastern coast of India. Cyclone Nilam forming in 24 hours! Yesterday’s low pressure has intensified into a well-marked low pressure and it is expected to transform into a depression BOB 02 and move in a WSW direction, it could intensify further today. BOB 02 is absorbing all the moisture from Arabian sea system. Low pressure over south-east has intensified slightly as pressure dropped at 1007 mbar. The JTWC (Joint Typhoon Warning Center) has upgraded the chance of it becoming a tropical storm at medium. This weather system would intensify into a well-marked low pressure on October 28 and move in a WSW direction. Upper air cyclonic circulation over Andaman sea has intensified into a low pressure area at 1008 mbar, it could intensify further and move in a SW direction, fresh tropical wave in the Arabian sea may drag it in a SW direction. Upper air cyclonic circulation still mostly remains disorganized, it is present in Andaman sea, south-west of Bangkok. It could intensify into a low pressure area on October 26 morning and could intensify further with lowest pressure shown by chart at 1002 mbar/1000 mbar during the last week of October, there are still 100% chance of formation of a depression in the Bay of Bengal. It could intensify into a low pressure area on October 24 or October 25 and could intensify further with lowest pressure shown by chart at 1002 mbar/1000 mbar during the last week of October, there are still 100% chance of formation of a depression in the Bay of Bengal. Fight over a name ends! Nilam – It is an Arabic word used in Urdu, name given by Pakistan. Double activity in the past? It is not the first time that weather systems in Arabian sea and Bay of Bengal were seen moving together. In May 2010, Cyclone ‘Laila’ in the Bay of Bengal while Cyclone ‘Bandu’ in the Arabian sea were seen whirling in their respective waters almost at the same time that is from May 17 till May 21 both the storms took a similar path as these storms are being predicted in 2012. ← Bay of Bengal warming up for a showdown?